Offered in 2017 for the first time as a spring program, this league for men and women will play an 8 game schedule followed by a single elimination tournament. Also new for 2017, this league is open to any players 14 years of age or older, with parental completion of paperwork required by state law. Divisions of play are offered based on level of competition and participation numbers. A team must have at least 8 players to start the game, four men and four women. The 9th and 10th players (one man and one woman) can be added at any time during the game. A team may begin play with 8 players without penalty but if a team has 9 kickers in the line-up, there will be an out recorded for the missing 10th player in the kicking order. 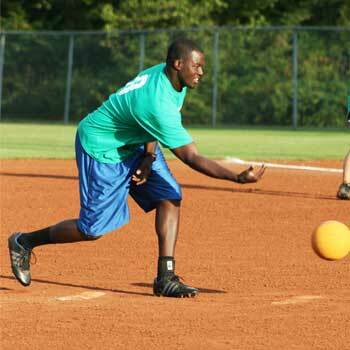 Teams will play on Wednesday evenings at Carl Yearwood and Jefferson Middle School fields.